It is a poem that describes Jon Lansman’s behaviour down to a tee as he tries to expel me from Momentum. Lies and deception, saying one thing to one person and another thing to another person, seem to have become a seamless part of Lansman’s political tapestry. It almost seems as if Momentum’s führer, because he is an unelected dictator, has forgotten what the word socialism means. This is why Momentum is not democratic. There is no obvious way to get rid of Lansman. If it wasn’t clear already it should be clear now. Lansman’s desire to succeed McNicol was motivated by his desire to continue with the ancie regime, the witchhunt included and using much the same methods. Below I detail how Lansman, when given the choice between being honest and open, lying and dishonest chooses the latter without fail. Lansman seems to have become so used to wheeling and dealing that he is incapable of behaving in any other way. Power seems to have gone to his head at the same time as any modicum of socialist principles have left it. In short Lansman has become a classic machine politican devoid of any real ideological commitment. As people will be aware, I was expelled by the National Kangaroo Court a month ago for crimes such as ‘abusing’ Louise Ellman MP who, in the name of security, supports Israel’s shackling, beating and incarceration of (Palestinian) children. (see Parliamentary debate on Palestinian child prisoners and detainees, 6.1.16.). Despite all the heated rhetoric of Labour’s Zionists, the NKC refrained from accusing me of anti-Semitism. I have covered the details in the following posts so I won’t rehearse the arguments again. 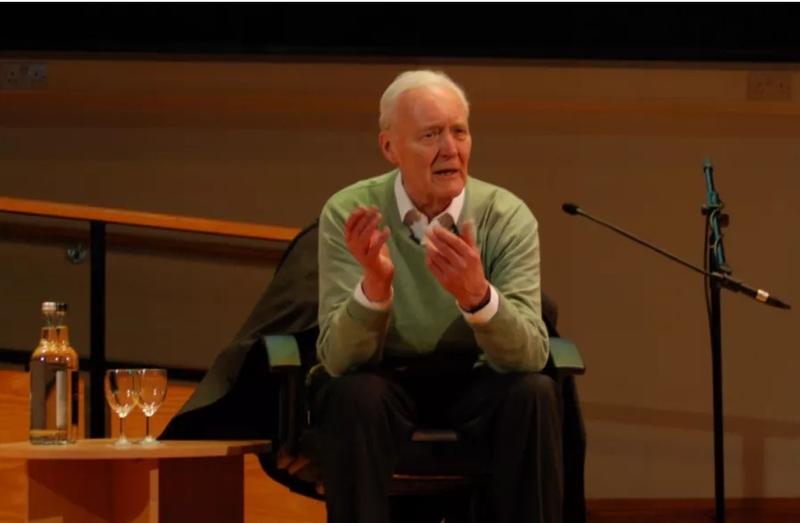 Tony Greenstein - Expelled for Opposing Zionism and the Israeli State – The Fight Goes On, How to Cure the Labour Party of anti-Semitism – Expel a few Jews! If it wasn’t clear up till now it should be blindingly obvious that the false anti-Semitism campaign which led to my expulsion is directed primarily at Jeremy Corbyn himself. Jackie Walker, Marc Wadsworth, myself and others are mere collateral damage. This week there have been two attacks on Jeremy Corbyn suggesting that he tolerates anti-Semitism. One was about an absurd mural whose ‘anti-Semitism’ is highly debatable and the other is the dodgy dossier of David Collier, much of which is forged, about the Palestine Live Facebook page. The Zionist ‘charity’ Campaign Against Anti-Semitism has made a second complaint of anti-Semitism against Corbyn. It should also be obvious, even to Lansman, that the false anti-Semitism smear campaign has nothing to do with anti-Semitism and everything to do with removing Corbyn. Why else would the Express, Mail, Sun give such enthusiastic support to the idea that Labour is anti-Semitic? Yet Lansman is determined to finish off what McNicol began and expel me from Momentum. Presumably he will do the same to Jackie Walker and Marc Wadsworth if they are expelled. Momentum has signally failed to oppose the anti-Semitism witchhunt thus far. It is now proposing to collaborate with it. Momentum has a Constitution, which was imposed by Lansman over a year ago. It has never been approved, still less debated by Momentum’s membership. 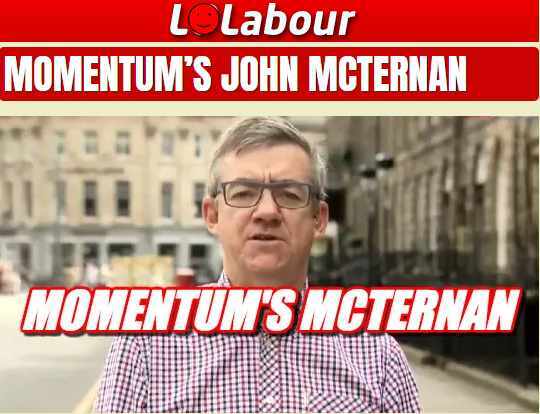 People were given a simple choice when Lansman destroyed the democracy of Momentum – take it or leave it. 5.8 Any member who does not join the Labour Party by 1 July 2017, or ceases to be a member of the Labour Party, or acts inconsistently with Labour Party membership, may be deemed to have resigned. 5.10 Where a member may be deemed to have resigned in accordance with Rules 5.7, 5.8 or 5.9 there will be a right to be heard by the NCG or a delegated panel before a final decision is made. 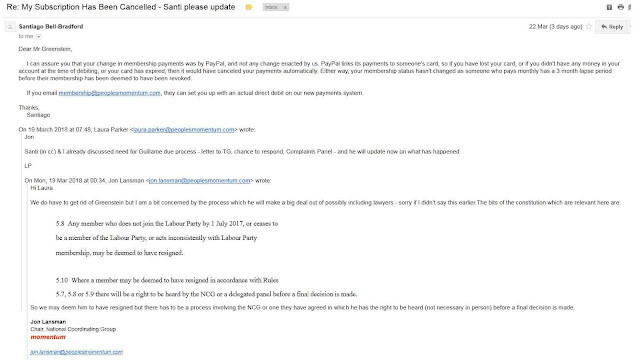 On 18th March I e-mailed Momentum nationally asking why they had ceased taking my subscription and assuming that they had done so because I had been expelled. On 22nd March a Santiago Bell-Bradford emailed informing me that I was wrong and the fault lay with Pay Pal. I was happy to accept this and I said I would contact Pay Pal directly. 17 minutes later another email arrived, from Momentum Info, informing me that it had come to their attention (in fact I pointed it out) that I had been expelled and I had 6 days to make written representations and a panel of the National Co-ordinating Group, the mainly unelected group that runs Momentum, or a panel thereof would meet to determine my fate. I wrote back almost immediately complaining that an email such as this should have a name attached to it and attacking their impersonal corporate culture. In my naivety I didn’t expect that this process was one of dirty tricks but merely the consequence of my expulsion. I pointed out that there seemed to be an omission in their letter, viz. that I had a right to be heard in person. I also stated that child care responsibilities prevented me from attending on Thursday and I suggested alternative dates. I also stated that ‘Your email gives the distinct impression that this is merely a matter of going through the motions.’ and pointed out that the constitution merely stated that I‘may be deemed to have resigned.’ At this stage I was still assuming that the email was sent in good faith. What changed this was a phone call I received about 15 minutes later from a member of staff Laura Parker. She phoned me to ‘explain’ why names are never used on emails because of the abuse staff get from Momentum members! This was wholly untrue since I had just received an email in the name of Santiago Bell Bradford. Laura too had recently appended her name to an International Womens Day email. I therefore found it difficult to take her claims seriously and when I tried to discuss the main content of the email she put the phone down. It was almost as if she was phoning me up to put me off the scent. It couldn’t have been clearer. There was nothing about due process and the right to a fair hearing. The aim was to be rid of me but they would have to go through the charade of a hearing. I had the right to be heard but ‘not necessary (sic) in person.’ Quite how Lansman can square having a right to be heard with not being present in person is something I haven’t yet got my head around. If the constitution didn’t mean in person then it would have used a different formula such as ‘the right to make written submissions.’ It didn’t. 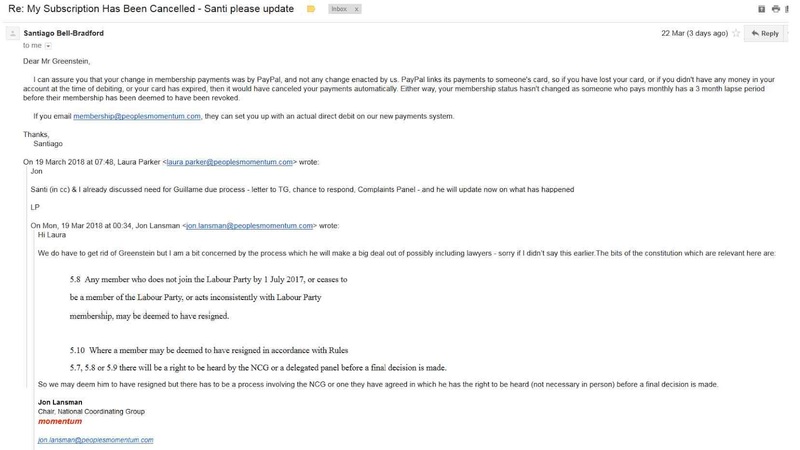 I followed this up with a further email to Lansman stating that if he wishes to engage in these tricks and deceptions then I shall be forced to treat him as I did the Labour Party and apply for an injunction. One thing that has puzzled me is the reference in Laura Parker’s email to Lansman: ‘Santi (in cc) & I already discussed need for Guillame due process’ what is a Guillame due process? It appears to be some form of internal Momentum office jargon. It has been suggested by a friend that it refers to a Pierre Guillame (Peter Guillam) a character in John le Carré's Tinker Tailor Soldier Spy who was described by Smiley as ‘cosh and carry.’ In other words it is merely emphasising the fake and fraudulent nature of any hearing I may have. It’s a case of Iain McNicol eat your heart out! 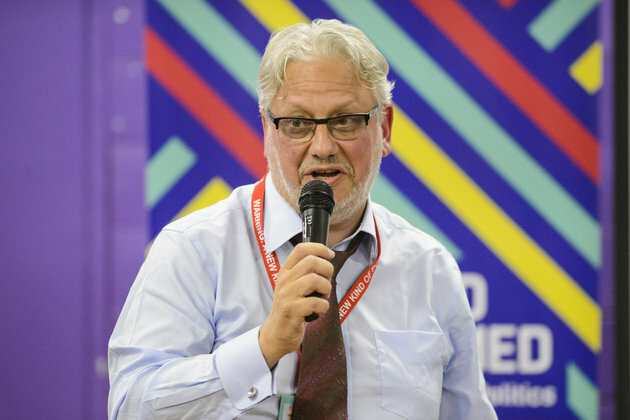 Far from Lansman stopping the witchhunt and democratising Labour’s disciplinary processes it would appear that if he had been selected as General Secretary he might have made Iain McNicol’s reign seem like the Prague Spring. What I find most surprising is that I am a relative minnow politically. If this is how Lansman behaves to me, with a complete lack of any integrity and honesty, how does he treat those he deals with on a day to day basis? What conception of socialism does Lansman adhere to that causes him to play these deceitful games? Is the expectation that staff members will lie an implied part of their contracts or is Laura Parker lying of her own accord? I haven’t received any response yet and on Monday I shall be seriously considering going to the High Court again to obtain an injunction against Lansman and Momentum.